The estates didn't see eye to eye on how their country should be run. Most of this conflict revolved around feudal privileges, land ownership and taxation exemptions. The First Estate - The Clergy (1.5% of the population)The Clergy were both powerful and wealthy. The Catholic Church owned approximately 10% of the land in France and was exempt from taxation. The power of the Church was under scrutiny from Enlightenment thinkers who called it corrupt and accused it of passing on superstitions. As time passed, a growing number of people agreed. 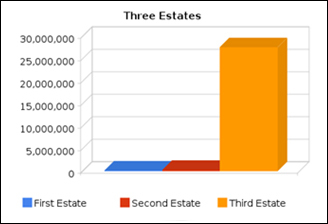 The Second Estate - The Noble (0.5% of the population)The First Estate was made up of members of the nobility and royalty. Their power and wealth came from feudal privileges, an idea left over from the Middle Ages. Due to birthright, all the best jobs and positions in society were reserved for members of the nobility and clergy. This right was passed down through the eldest sons of each family. The nobles were the ruling class and maintained their power through the feudal system, which made it impossible for someone outside the system to move up the social ladder, despite their intelligence or capabilities. Nobility were able to tax the peasants who lived on their estates, and were also largely exempt from taxation. 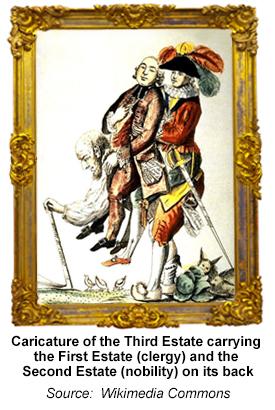 The Third Estate – Everyone Else (98% of the population) This estate ranged from poor street people living in cities, to peasants living on estates, to landowning farmers in the French countryside, to wealthy, educated merchants. Although they were a diverse group, they were united in their resentment. They lacked access to the power structures of society, as all the best positions were reserved by feudal privileges. Though powerless, they paid the vast majority of taxes. The leaders of the Third Estate were known as the bourgeoisie, or middle class. They were urban, often wealthy and educated, but extremely angry because they were limited socially. Throughout the countryside, feudalism caused problems for peasants who were the legal property of their landlords. Their mobility was restricted, they were largely prohibited from owning land, they paid very high taxes and they had very little freedom.